Maybe it’s the Blu-Ray selection? Or those cool-looking Dyson vacuums? 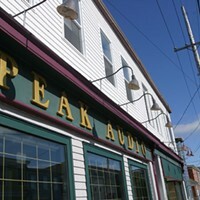 Whatever the reason, the blue-and-yellow chain store of expensive warranty plans and impossible Christmas shopping has won your votes as Halifax’s Best Home Entertainment Store, knocking former first-place champion Peak Audio down to silver. Globes AVU, as it did last year, comes in at a respectable third.